I recently picked up a bottle of Firelit coffee liqueur, a collaboration between Jeff Kessinger, a former Bock Spirits sales rep, and St. George Spirits of Alameda. Its an elegant take on coffee liqueur that eschews the syrupy sweetness of Kahlua in favor of a drier, higher proof spirit with the fruitier, more acidic coffee style of Third Wave coffee roasters. It combines cold pressed coffee, unaged Chardonnay brandy, brandy made from coffee grounds, and whole vanilla bean. Initially featuring Blue Bottle Yemen single origin beans, the current batch is made from Aged Mocha Java by Weaver’s in San Raphael. It’s an intensely local, artisanal product through and through. However, it’s also an intensely particular product as well. The alcohol content is 30% (60 proof), so when using it in recipes calling for coffee liqueur, the recipe may need adjustment to avoid resulting in a boozy, out of balance cocktail. Likewise, the sugar content is about half that of Kahlua, so its use as a sweetening agent is also more limited. I think its great on its own or with a little ice. For mixing in a cocktail, it requires some thought in order to balance it well – but that’s the fun with ingredients like this. Limitations in one direction open up (tiki) possibilities in another. 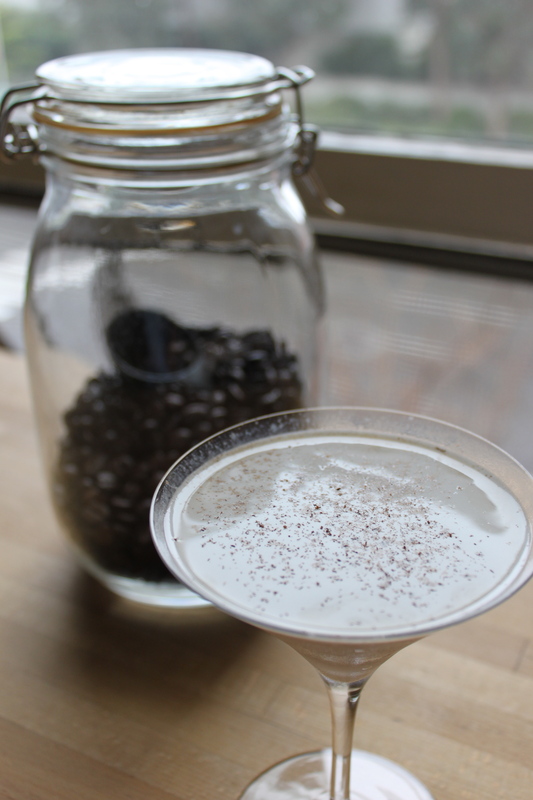 I’ve previously used it in a variation on a Coffee Flip for Mixology Monday. (Ironically, the traditional coffee flip recipe does not include any coffee.) Here, I took the base recipe for a Brandy Alexander and steered it in the direction of a dessert cocktail inspired by Vietnamese iced coffee – which for anyone who has ever had cà phê đá previously knows, it is caffeinated crack dipped in sugar served over ice. My idea was to add booze to the equation. Call it Four Loko meets the Pacific Rim. I promise it tastes better than that sounds! Shake with ice and strain. Garnish with grated coffee bean.